24 Hour Comfort Alice girls extra wide width lace up comfort shoes. 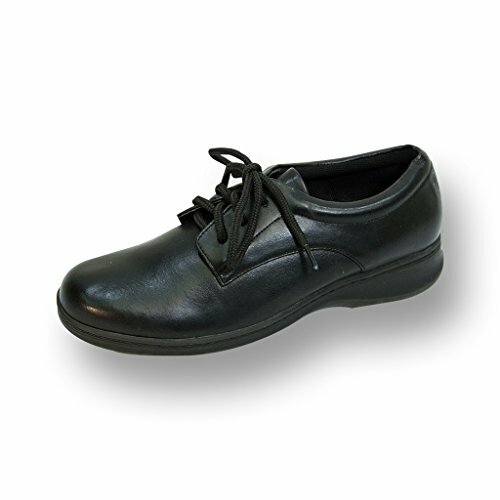 This ladies durable and lightweight 3 eyelet lace up shoe features a non slip outsole made of EVA and rubber materials, back of heel cushion for comfort and fit, and an all leather upper for continuous breath ability and around the clock support and stability. BONUS: If needed, the included extra insole can be inserted into shoe to decrease width for better fit. **About Manufacturer** Footwear International Corporation (FIC), located in Fairfield NJ, began its manufacturing and wholesale operations in 1977 and has since continued to supply quality footwear at competitive prices to consumers located across the globe. Specializing in wide width shoes, FIC's variety of trademark brands (24 Hour Comfort, Peerage, and Floral) have become widely recognized for quality, fashion, comfort, and affordability.